News from Claude Niek at CSO Yachts and Thierry Voisin of a €200,000 price reduction on their joint listing for sale, the 24m Leopard motor yacht Cristal 1. Built by Arno in 2002, Cristal 1 has just been refitted to the highest standards and her design features the latest technology. Her spacious layout within a 6 metre beam offers accommodation for eight guests in three cabins. Pushing a top speed of 36 knots thanks to her twin MTU engines, she cruises at a brisk 30 knots. 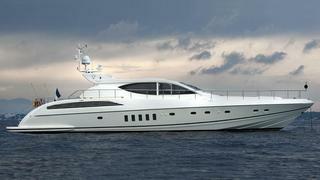 Cristal 1 is currently located in Cannes and is now asking €1.09 million.